Enriched with Dead Sea Mud & Minerals. Nourishing and Soothing for a Healthy. 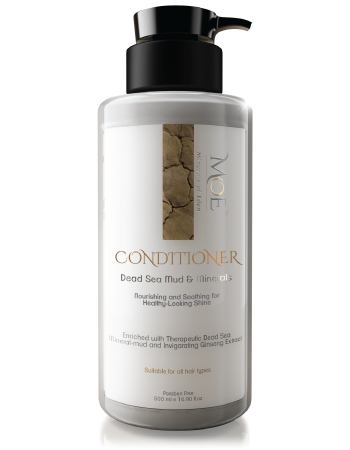 Introducing our intensely moisturizing Dead-Sea hair conditioner, specially formulated to restore, balance and nourish the hair shaft, right down to the scalp. Particularly effective on hair exposed to the elements on a daily basis, enriched with 26 natural Dead-Sea minerals including stimulating Ginseng to promote healthy, glossy hair, this conditioner restores softness and flexibility and prevents hair loss in fragile scalps. Water (Aqua), Behenyl Trimethyl Ammonium Chloride, Cetearyl Alcohol, Stearalkonium Chloride, Peg-20 Stearate, Polyquaternium-7, Sea Salt (Maris Sal/Dead Sea Salt), Macadamia Ternifolia Seed Oil, Argania Spinosa Kernal Oil, Phenoxyethanol, Ethylhexylglycerin, Hydroxypropyltrimonium Hydrolyzed Wheat Protein, Fragrance, Panax Ginseng Roots Extract ,Triticum Vulgare (Wheat) Germ Oil, Citrus Aurantium Dulcis (Orange)Flower Oil, Silt (Dead Sea Mud), Panthenol, Sodium Benzoate. After shampooing with MoE shampoo, massage this conditioner along the hair shaft and gently untangle hair. Leave to work for up to 3 minutes and wash out thoroughly in warm water. We've received your product review and we'll publish it shortly, subject to considerations of the system. Awesome product that adds a lot of moisture. Actually this was a Christmas present. But have tested it myself and was very pleased. Worth the price. Does wonders for your hair and smells wonderful. The best conditioner I've used actually. It does not weigh hair, fragrances lovely and clean and gives a silky hair. My new favorite! The bottles have perfect size, fits nicely onto the shelf in the shower. Both shampoo and conditioner from this series is absolutely amazing! It smells so wonderful, and the smell stays long in your hair! My hair is so soft and pleasant to the touch! I have pretty long hair, and MUST use conditioner to comb my hair, and this really does wonders! Recommended! Have psoriasis and this is a bit like a last resort for me, when I've tried everything! At first wash, I felt that the scalp is not quite as tight as it often is for hair washing, and I peel a little less than usual after hair wash. It also has a lovely smell, clean and delicious! Good pump and not least - easy to extract. I love this conditioner from Minerals of Eden! It is easy to comb the hair and smells amazing. Along with the shampoo in this series it leaves the hair soft and shiny. It is gentle on the hair and scalp. Highly recommend this conditioner. This product works great!! Leaves hair very soft & shining. Smells very nice too!! !